An 18-year-old man has been charged with a public order offence over homophobic stickers found plastered around London’s East End. Mohammed Hasnath, 18, of Leamouth, Tower Hamlets, was arrested last month at his home. He has been charged under section 5 of the Public Order Act of causing harassment, alarm or distress. He allegedly posted the stickers at four locations in the area between Friday February 11th and Monday February 14th. Mr Hasnath is on bail and will next appear at City of Westminster magistrates’ court on Wednesday June 1st. 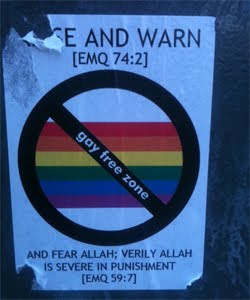 The stickers, which were found in Brick Lane, Poplar, Bow and Canary Wharf, showed a red line through a rainbow flag and the words ‘gay-free zone’. They said: “Arise and warn. Gay free zone. Verily Allah is severe in punishment.” At least 70 have been reported. After the anti-gay messages were discovered, local residents began a campaign to remove them and replace them with messages of love. A Pride parade was also planned but had to be cancelled after it was revealed that one organiser had links to the far-right group English Defence League.